Researchers at the Princess Margaret Hospital in Toronto, Canada have found that prostate cancer survivors can improve their health by doing a little regular exercise. In fact, they strongly recommend resistance exercise. Resistance exercise, or strength training, involves pushing, squeezing, bending, or stretching something to create an opposing force. Resistance exercises improve the strength of muscles, and doing them can also trigger other health improvements. For the study, a combined research team from the University of Guelph, the Princess Margaret Hospital, and York University examined the effects of androgen deprivation therapy (ADT) in prostate cancer survivors. ADT causes side effects that are known to affect the quality of life, but resistance exercise can help offset many of the side effects of ADT. The research team randomly assigned 66 prostate cancer survivors receiving ADT to six months of home-based aerobic or resistance training. Psychosocial well-being and physical fitness were measured at baseline, three, and six months, and again six months after the intervention. The researchers found that the resistance exercise-training group demonstrated clinically significant improvements in health-related quality of life. 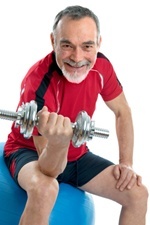 Santa Mina, D., et al., “A Randomized Trial of Aerobic versus Resistance Exercise in Prostate Cancer Survivors,” J Aging Phys Act. December 10, 2012.